I love, love, love these muffins. Happily Sadly, no one else in my family likes them, so I have to eat them all myself bring them to the office to share. These are delicious. The big tip I have is to find a shop where you can buy poppy seeds for an affordable price, otherwise this is a total luxury. Amazon has some reasonably priced poppy seeds as a part of their add-on program, if you’re buying $25 worth of items from them. Line a 12-cup muffin tin with cupcake liners. Whisk together flour & starch, xanthan gum, baking powder, salt, lemon zest, and salt in a bowl. Whisk in poppy seeds and chia seeds (if using). In a stand mixer, cream the butter and sugar until light and fluffy. Beat in eggs one at a time. Change the mixer speed to low, then slowly add the flour mixture until they are just combined. Using a cookie scoop or ice cream scoop, fill each cupcake liner with batter, then bake 18-22 minutes, until golden brown and a toothpick comes out clean. Allow the muffins to cool. Once they’re cool, make the glaze. Combine lemon juice, confectioner’s sugar, and zest. Whisk together. If it’s thin, add a tablespoon at a time of confectioner’s sugar until no longer thin. Glaze muffins, then eat. Yum! We eat a lot of gluten-free muffins around here – sometimes they’re Donut Muffins, sometimes they’re Zucchini chocolate chip muffins, but sometimes they’re simply blueberry or chocolate chip muffins. This is our current favorite muffin recipe – adaptable for whatever you want to put in them. 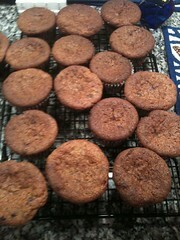 Mix 1/4c brown sugar and 1/2 tsp cinnamon and 1 TBS diced butter/margarine to sprinkle on top of the muffins. Preheat oven to 400F. Either lightly grease a 12-cup silicone muffin pan or put muffin cup liners in a metal 12-cup muffin pan. In a stand mixer, or a large bowl, combine the dry ingredients. Stir together to make sure they are well blended. 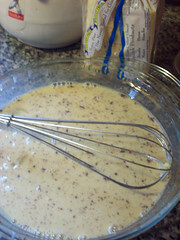 Add the liquid ingredients (milk, melted butter, egg, and vanilla) one at a time, mixing between each addition. Do not over-mix. Add chocolate chips or blueberries to the mix, and make sure they are just combined. Lumpy batter is not a problem for muffins! Using a medium cookie scoop, spoon into the muffin cups. If making chocolate muffins, sprinkle mini chips over the muffins. If making blueberry muffins, cut butter into brown sugar and cinnamon, then sprinkle that on top of the muffins. Bake for 20 minutes, until muffins are golden brown, risen, and spring back to the touch. Allow to cool in the pan 5 minutes, then remove from the pan and let cool on a cooling rack. Eat and enjoy! We’ve made these in 3 variations – cinnamon-sugar, chocolate, and powdered sugar. All 3 work well using the basic recipe below. I’ll put the variations on the bottom. Using a silicone mini-muffin pan or mini-donut pan makes this very easy. And using the donut pan makes kids so happy! This is a delicious gfcf, gluten free, family-friendly recipe! It can also be (if you double check ingredients!) a wheat free, dairy free, soy free, egg free, tree nut free, peanut free, fish free, shellfish free, corn free, top 8 allergen free, and vegan/vegetarian recipe.With two eggs in the recipe, it should work well with an egg replacer, but I haven’t personally attempted that as of yet. 2 cups GF flour – brown rice or millet works well, with a little bit of bean flour or amaranth added. 1 cup starch – white rice flour, tapioca starch, or arrowroot starch work well. Preheat the oven to 375F. Lightly grease the silicone mini-muffin or mini-donut pans. We prefer the Trader Joe’s coconut oil spray, but any light greasing/oiling will work. In one bowl, whisk together flour through xanthan gum (insert additional ingredients per the below variations). In a large measuring cup or another bowl, whisk together the milk, vinegar, and vanilla. In the bowl for the stand mixer cream the sugar and butter, beating with the paddle attachment for a few minutes until light and fluffy. Add eggs one at a time, scraping down the sides of the bowl with a spatula after each addition. Mix until combined. With the mixer on low, alternate adding 1/3 of the dry ingredients with 1/3 of the wet ingredients. Scrape down the sides a couple times, and mix until just combined. It’s not good to overmix muffin batter! Use a cookie scoop or a spoon to add the mix to the pans. fill just below the top of the muffin cup. Bake at 375F for 15-20 minutes, until the donut bounces back a bit when you poke it with your finger. Allow to cool for about 5 minutes, then remove from the pan to a cooling rack. After the donuts have cooled, follow the below variations for coating. In one shallow bowl, melt 1 stick butter. In a second shallow bowl, mix the coating ingredients. Dip all sides of the donut in the butter, then in the coating. Return to the cooling rack, then place in a container until they’re devoured. Melt butter and chocolate chips in a small saucepan on the stovetop over low heat. Once melted, remove from heat. Add 1 TBS milk, then whisk in powdered sugar. You want this to be a very thick icing. If the fudgy icing is too stiff, add a bit more milk. If it’s too thin, add a TBS of powdered sugar at a time. Frost donuts or muffins lightly. This is a rich topping, so a little goes a long way. Sadly, I’ve never had an apple cider donut with gluten, but these taste the way I imagine the originals taste. They also taste the way the cider donuts at the fair smell. Yum! This is a delicious gfcf, gluten free, family-friendly recipe! It can also be (if you double check ingredients!) a wheat free, dairy free, soy free, egg free, tree nut free, peanut free, fish free, shellfish free, corn free, top 8 allergen free, and vegan/vegetarian recipe. As there are only 2 eggs in this recipe, they should be easy to replace, though I haven’t done it personally. Grease a doughnut pan and/or a mini-doughnut pan. If you don’t have either one, you can make mini-muffins as “donut holes”. Preheat oven to 325F. In the bowl of your stand mixer, combine everything from flour through salt. Mix it for a moment to make sure it’s well combined. Add in each of the liquid ingredients (cider, milk, eggs, vanilla, butter), allowing them to become well combined after each addition. Fill the donut pan a bit below full. Bake 12-15 minutes. Doughnuts are ready when you touch them and you can feel it spring back. Let them cool for 5 minutes before removing from the pan. 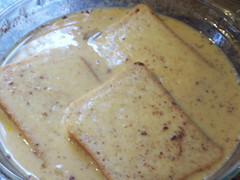 After the doughnuts have cooled, combine sugars and cinnamon in one shallow bowl, and melt butter in another shallow bowl. Dip both sides of the donut in the butter, then put in the cinnamon-sugar bowl until they’re coated. 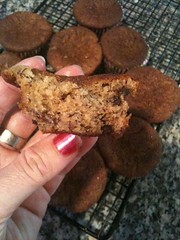 We have had a very good, dependable, easy banana muffin recipe, but sometimes you want a little something different. This new recipe makes incredibly easy and delicious muffins, and we’re really enjoying them! The girls are eating them for breakfast, snacks, and dessert, so they don’t last long. This is a delicious gfcf, gluten free, family-friendly recipe! It can also be (if you double check ingredients!) a wheat free, dairy free, soy free, egg free, tree nut free, peanut free, fish free, shellfish free, vegetarian, vegan, and top 8 allergen free recipe. Preheat oven to 350*F. Spray or grease muffin pan or insert paper muffin cups. Whisk flour through salt together in a medium bowl. In your mixer’s bowl, beat bananas through eggs. Slowly mix the flour mixture into the banana mixture, until it’s completely combined. Add the mini-chocolate chips and mix until just combined. Add 1 ice cream scoop of batter into each muffin cup and bake at 350*F for 18-20 minutes. This recipe makes 18-20 muffins. But don’t expect them to last very long! Ours rarely last a day! 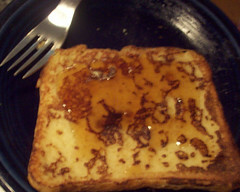 The girls love French Toast, but it’s my mother who usually makes it. This past weekend my parents were gone for the day, so they sent me on a hunt for a good recipe. After much Googling, I ended up with this recipe which was inspired by Alton Brown’s recipe – because if Alton made it, you can’t go wrong! I tweaked it for our taste buds, allergies, and for my own cooking preferences. This is a delicious gfcf, gluten free, family-friendly recipe! It is also (if you double check ingredients!) a wheat free, dairy free, soy free, tree nut free, peanut free, fish free, shellfish free, corn free, and vegetarian recipe. Be sure to check the allergy notes at the bottom of the recipe. Preheat oven to 250. Set a lasagna pan or similar 9×13 pan near the stove. In a deep pie dish, combine the milk substitute, eggs, sugar, vanilla, cinnamon, and salt. Whisk gently, so the milk/egg mixture doesn’t spill. Heat your griddle or skillet to medium heat. Add about 1 TBS oil or margarine to pan and swirl around so it coats the pan. Dip bread into mixture, allow to soak for about 1 minute on each side. Pick up a piece of bread and gently shake the excess egg mixture into the pie pan. 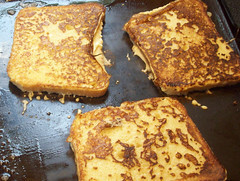 Lay 2-3 slices of bread in the griddle/skillet, depending on the size of the bread and your pan. Cook until golden brown, approximately 2 to 3 minutes for each side. When browned, remove from griddle and gently put in the lasagna pan, then slide the pan into the oven. Continue with the next set of bread slices, until all of the french toast has been made. Serve to many cheers and soon-to-be-empty plates! This tastes great with maple syrup, or perhaps a bit of confectioner’s sugar sprinkled on top. 1 Our favorite bread recipe is perfect for this, as is our sweet bread recipe, but any gluten-free bread will work. 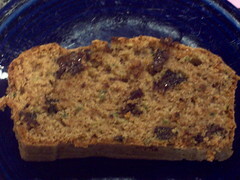 The Kinnikinnik loaf pictured was perfect, because it tasted a bit dry when eaten plain. 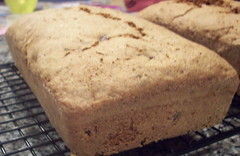 Our favoite purchased bread is Ener-G Brown Rice Bread, which tastes especially wonderful when toasted. 2 We usually use Earth Balance Organic margarine tubs, which are Kosher and dairy-free. However, that margarine includes soy protein. Fleishmann’s Unsalted is also Kosher and dairy-free, but only uses soy oil – no soy protein. Alternatively, to make the recipe safe for the corn or soy-free, you can use canola or another cooking oil to coat the griddle. Who doesn’t love a breakfast of waffles? We make a big batch, and then refrigerate or freeze the extras so they can be heated up in the toaster on busy mornings. While this recipe has 4 eggs, it can be substituted with a commercial or homemade egg replacer without sacrificing taste or quality. This is a delicious gfcf, gluten free, family-friendly recipe! It is also (if you double check ingredients and use appropriate substitutes!) a wheat free, dairy free, soy free, egg free, tree nut free, peanut free, fish free, shellfish free, corn free, top 8 allergen free, and vegan/vegetarian recipe. In a large mixing bowl, whisk together flour through salt. In a medium mixing bowl, combine milk substitute through vanilla extract. Slowly mix the liquid into the flour, and stir until smooth. This batter will act differently based on humidity, temperature, and phase of moon. So you may need to add 1/2 cup more flour or 1/2 cup more water, depending if it is very wet or very thick. Add optional blueberries when the batter is well mixed, and stir until just incorporated. 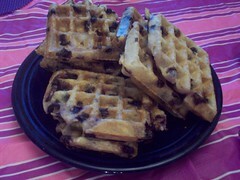 Use a ladle to add waffle batter to the waffle iron, and cook according to device instructions. Keep waffles warm on a plate covered by a tea town in the oven set at 200 degrees. 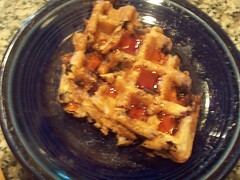 Serve with margarine, maple syrup, and Gooseberry Syrup. My dear friend Nanny Ogg had an overflowing zucchini crop last year, and every time I sent her an instant message, her status had something to do with making, serving, or eating Chocolate Chip Zucchini Bread. It does taste every bit as good as I thought it would, too! This makes 2 loaves. This doubles wonderfully, too! This is a delicious gfcf, gluten free, family-friendly recipe! It is also (if you double check ingredients!) a wheat free, dairy free, soy free, tree nut free, peanut free, fish free, shellfish free, corn free, and vegetarian recipe. In a small bowl, whisk together flour, starch, xanthan gum, baking soda, baking powder, salt, and cinnamon. Add zucchini and vanilla, and combine well. Stir in flour mix, and mix well. Add chocolate chips and stir just until they are distributed well. Divide batter into two loaf pans, then bake for approximately 1 hour. Start testing with a toothpick after 45 minutes – when the toothpick comes out clean, it’s done. Cool for 10 minutes on a cooling rack in the pans, then knock out of pans and cool completely. Slice and serve. While it’s delicious hot, it might be better to wait for it to cool – it’s only somewhat crumbly after it’s cooled, but quite crumbly when hot. This recipe freezes well if your freezer isn’t already crammed with zucchini and the bread isn’t inhaled by your family!